I’d like to welcome the law offices of Creason, Moore, Dokken & Geidl to the Inland Solutions family. 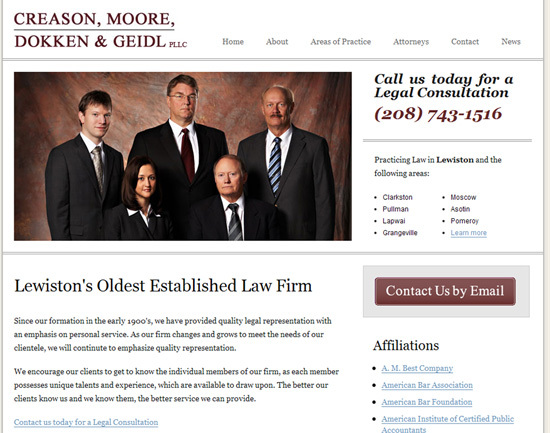 Creason, Moore, Dokken & Geidl is one of the oldest law firms in the valley. They were first established in 1902. You can learn more about the firm on their About page. When I was first contacted by CMD to create a new website for them, I had to take a closer look at how Attorneys gained business. The majority of law firms rely on word-of-mouth to obtain new clients. So I made the assumption that if you are visiting the CMD website, you’re probably looking for information that supports what your friend or colleague that referred you to them had said. With that in mind, each web page provides as much factual information about the law firm as possible, while putting a heavy emphasis on either calling the law firm directly or filling out one of a number of contact forms. It was a pleasure working with everyone at Creason, Moore, Dokken & Geidl.